Purchased Customers are entered into Frazer if the program is used by a finance company for the purpose of taking customer payments and printing documents (see also Sale of Receivables). In some cases, a customer may be entered as purchased by the dealership from the finance company if the finance company no longer wishes to maintain the account due to customer default, etc. 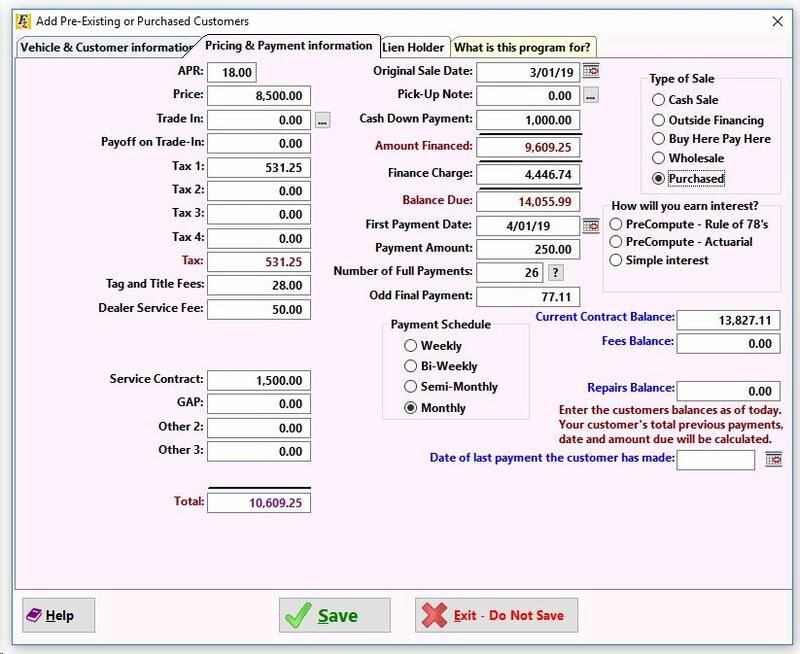 To begin entering Pre-Existing Customers go to Sales >> 7 - Add Pre-Existing Customers. Be sure the enter the Purchase Date, the Purchase Cost, the customer's information, as well as the original sale date. Enter the Sale Date and the customer's information as it would appear on their paperwork. The Sale Date is the date of the sale to the customer who purchased the vehicle. The second tab is Pricing and Payment information. All of the information entered here is from the original sale - the price of the vehicle, the taxes assessed, what was allowed for the trade-in (if applicable), any service contracts or other fees, down payment, pick up note, and finance charge . The terms of the payment schedule must also be entered as well as the customer's current contract and fees balance. 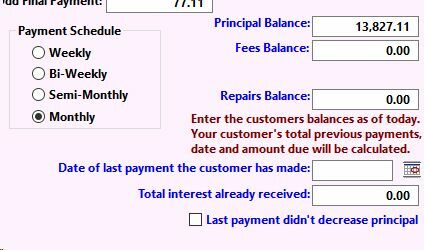 If the sale is Simple Interest, the principal balance, date of last payment and amount received in interest MUST be entered in order for Frazer to properly calculate the customer's next due date and amount owed. Once the necessary information is completed, click on . To see the resulting information, go to , highlight the customer and select either by double-clicking or clicking on . 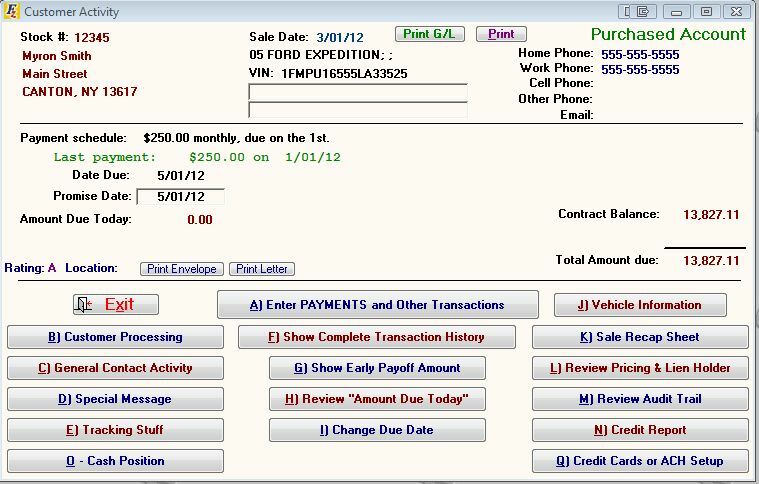 To see the effect a purchased account has on the General Ledger, click on . An Unearned Discount and Unearned Interest (for pre-compute only) will appear. To correct information after a purchase customer has been entered (an incorrect balance, sale date, etc. ), click on and then then . 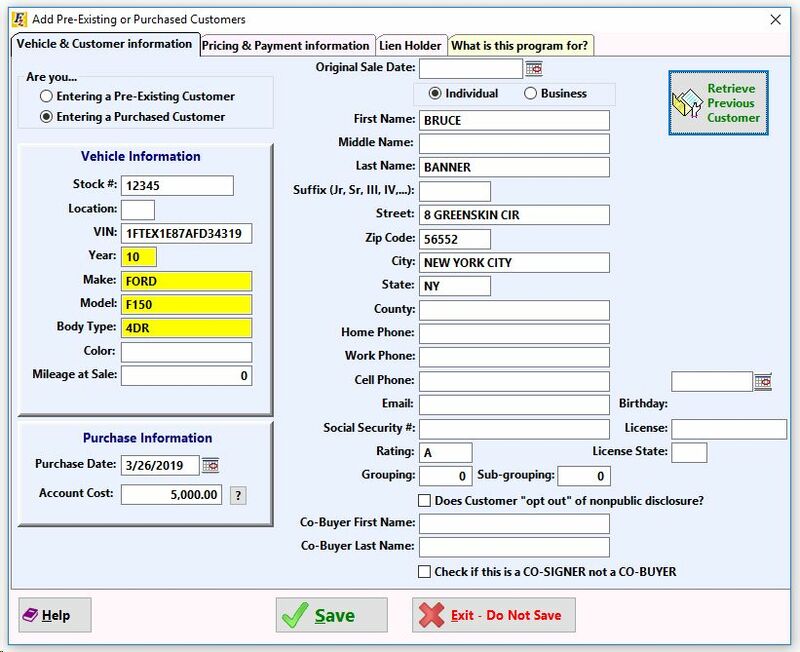 The pre-existing customer screen will open directly so that the original information may then be edited.